My son, 12 years old, has always been a bit anxious, and quick to get frustrated/angry. He is a great student with high honors, sociable with good and many friends. At home he has always been loving and funny, but also insecure, angry, criticizing and name calling his older brother. His anger comes and goes, however it is increasing lately, yelling at me and his father if he is angry (especially when he does not get his way). He is unreasonable during those times and refuses to talk civilly about issues. He has taken to yelling and talking over us so we can't get a word in. He appears really out of control with his anger, destroying things (not lately, but he has). He seems to go up very fast. He eventually calms down and feels bad and apologizes. He says how bad he feels, that he did not mean anything he said, he loves me, but he can't stop when he feels this way. Lately he is cursing directly at us. We have difficulty with consequences, as they seem to work for a very short period, but do not really resolve the problem. We (individually and as a family) have seen several counselors, it works for a little while and then he hates them and does not want to go anymore. I am concern of what the future could bring. Any suggestions on how to handle these situations? Hello Maria, and thanks for telling your story here. Your son's anger is trying to tell you something, and it is important that you and your husband get the message. He's telling you, "If you don't take charge of this family, I will. And I won't do a very good job, because I'm just a 12 year old kid." That's not because he's bad, it's just that he needs to be clear on where he stands in your home, and it sounds to me like you and your husband have trouble setting clear limits for him and following through with firm and loving consistency. I say this mostly because you mentioned that his anger seems to be worse at home. I encourage you to read this page on parenting skills for the angry child, and follow all of the recommendations. I also strongly encourage you and your husband to try the audio program below. 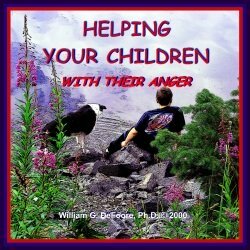 It will give you a better understanding of your son’s anger, and you’ll gain some knowledge and skill in terms of how to respond. You can do this, Maria. The help you and your husband need are here. Focus on the goodness in your son, while restoring the necessary order, and claiming your authority as a parent. Your son desperately needs you and your husband to be in charge. Hello. You said your son and your partner had a falling out. Was your partner abusive? Your son has good reasons for his anger, and as his mother, it's your job to find out about the pain and fear that are behind his anger. It sounds like he may not feel safe with your partner in the house. Use your good sense, and ask yourself if this is a safe environment for your son. My son had a big falling out with my partner and they were verbally abusive to each other. I was pregnant with our first child together too. I ended the relationship, but now our daughter has arrived. My ex partner has been there to look after us due to an emergency C section. Our relationship seems to be getting back on track and my partner and my son seemed to have buried the hatchet. But my son has been so angry since my partner has been back on the scene. He takes his anger out on other family members and has an unrecognized look in his eyes, fueled with anger and hate. I have tried to get him to tell me how he is feeling but it doesn't match with his behavior. I was wondering if you could help me? Join in and write your own page! It's easy to do. How? Simply click here to return to Adolescent Anger Stories.